New laptops on the way? Apple holds its Worldwide Developers Conference every year, and with WWDC 2018 kicking off on June 4, there's plenty of speculation about what Apple might have in store for iOS, macOS, tvOS and watchOS. It turns out we might just get some new hardware too. As Apple-centric sites including AppleInsider and The Mac Observer have noted, some MacBook and MacBook Pro models are now displaying delivery dates after WWDC 2018 starts – suggesting Apple is about to refresh at least some of the models, and doesn't want to deliver hardware that'll soon be out of date. While WWDC is traditional focused on software and intended for app makers, Apple has been known to unveil new devices in the past. In 2017 the HomePod was revealed to the world during the main keynote, so this year it could be the turn of the MacBook. It's not clear exactly which models might get an upgrade or what that upgrade might be, though a refresh involving Intel's new Coffee Lake CPUs is one possibility. We've also heard rumors that Apple is planning to power its laptops with its own custom-made processors in the next few years. It's almost exactly 12 months since the MacBook got its last refresh, while we haven't seen updates to the MacBook Pro for even longer. The timing is certainly right for some new models even if a major revamp of the hardware range appears pretty unlikely. 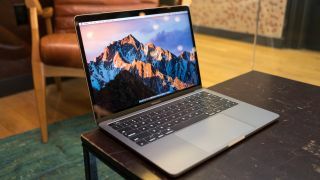 Something Apple might want to do with the new laptops it brings out is fix the keyboards: failure rates are reportedly higher than normal for models with the new 'butterfly' switch design, with the ultra-compact mechanisms apparently prone to getting stuck. In a couple of weeks' time we'll see what Apple has in store, but maybe hold off on that MacBook or MacBook Pro purchase for now.